for ice. Also, a great way to keep a bottle of wine chilled simply add some ice and use at the dinner table or outdoors. The insulated ice bucket has a double wall Stainless Steel lining keeping ice chilled to last longer, insulation helps prevent the outer wall from being too cold to touch & prevent condensation forming. but is also attractive and stylish. Makes a great biscuit barrel. Canister for flour sugar etc. On your bench for utensils. Outdoors as a cutlery holder when barbecuing or picnics. wipe the outer wall with a damp soapy cloth then dry to preserve the lustre and look. Caring for your Ice Bucket will give it the potential to last for years. Purchase our matching Galrose Dezigns Cocktail Set or other stunning products from the range to compliment this Elegant Ice Bucket. 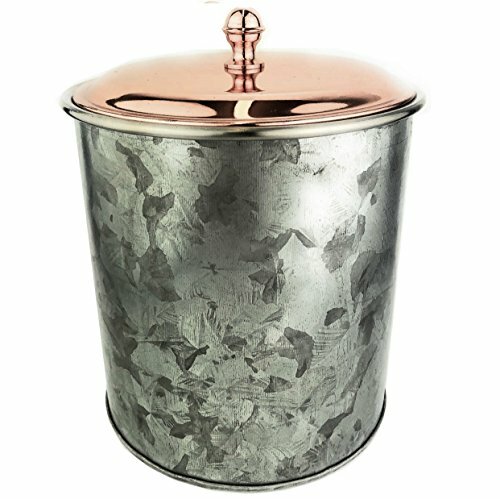 Hand Made in India this Stylish new look Heavy Duty Double Walled Ice Bucket is Made from Uniquely Finished Galvanized Iron on the Outer with a High Grade Stainless Lining on the Inner Making a Double Wall Insulation and Finished with a Rose Gold Lid. The Sophisticated Way to Serve Ice at the Bar or Dinner Table. The Insulated Double Walled Construction Prevents Moisture from Forming on Exterior Keeping your Ice from Melting away too Quickly. The Rustic Look also Makes it Ideal for Outside Entertaining Whilst Keeping your Wine and Champagne Chilled. Contrasting Rose Gold Lid adds a Touch of Class to these Decorative Ice Buckets. Sturdy but Classy this Elegant yet different Ice Bucket Bar Accessory will last for Years to Come. Ideal as a Canister for Storing Pretzels Biscuits Bar Stirrers etc the List is only Limited by your Imagination. Measures 6 inches high and 5.5 inches wide and holds 60 fluid oz. Simply wash in Soapy Water and Towel dry after use Finger Marks are a thing of the past with the Unique Galvanised Finish your Ice Bucket will Always Look Stunning. If you have any questions about this product by Galrose Dezigns, contact us by completing and submitting the form below. If you are looking for a specif part number, please include it with your message.